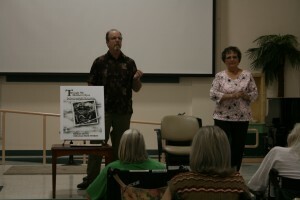 On Saturday May 9, 2009, Michael and Jean-Marie were the special guest speakers at the Veterans Home of California, Yountville, 180 California Drive, Yountville, CA. 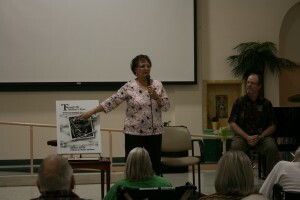 Michael and Jean-Marie greets the audience of veterans and their families. 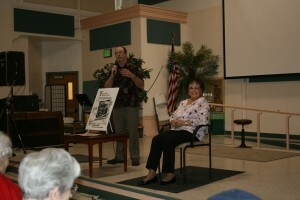 Michael sets up the story for the audience. 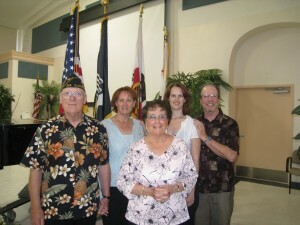 From left to right: Michael’s father-in-law, Bob Thompson (a veteran of the Vietnam war and a member of the American Legion, Cloverdale Post 293); Michael’s mother-in-law, Lou Thompson (Secretary and Treasurer of the American Legion Auxiliary, East Palo Alto Unit 472); Jean-Marie; Michael’s wife, Angela McCoy (Second Vice-President of the American Legion Auxiliary, East Palo Alto Unit 472); and author Michael McCoy.